Sunday morning in Detroit dawned bright and beautiful, perfect for a morning marathon. Not that I would be able to run in one. No, the city was conducting a race in the area surrounding our hotel, which left us somewhat stranded. 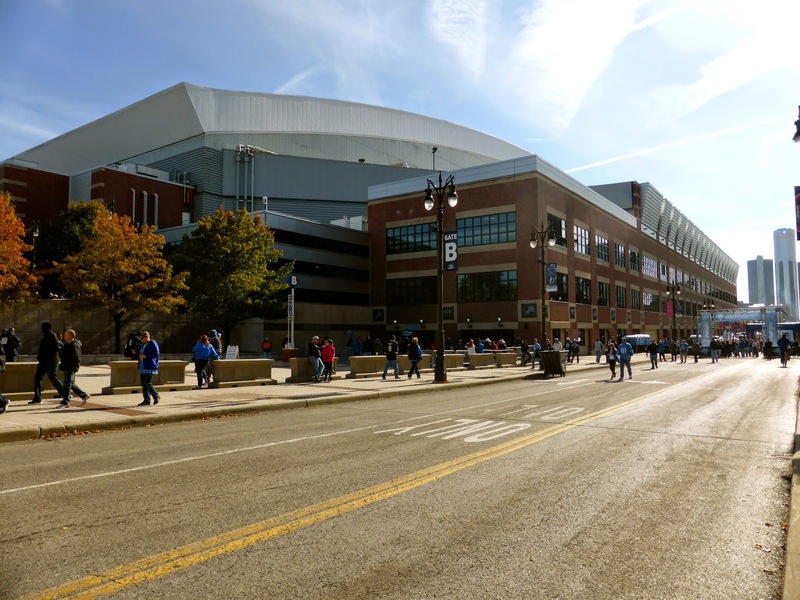 As Sharpy and I tried to complete the short drive to Ford Field, we were stymied on all sides, unable to get across Michigan Avenue or Trumbull Street to make our way to the stadium. After a few fruitless attempts at finding a way through, I gave up and parked the car about 3 blocks from the hotel (after driving a couple of miles) and Sharpy and I walked the mile and a half to the stadium in under 30 minutes. In the end, this was a bit of good luck as parking spots on the street would have been hard to find with so many being taken by those participating in the marathon. 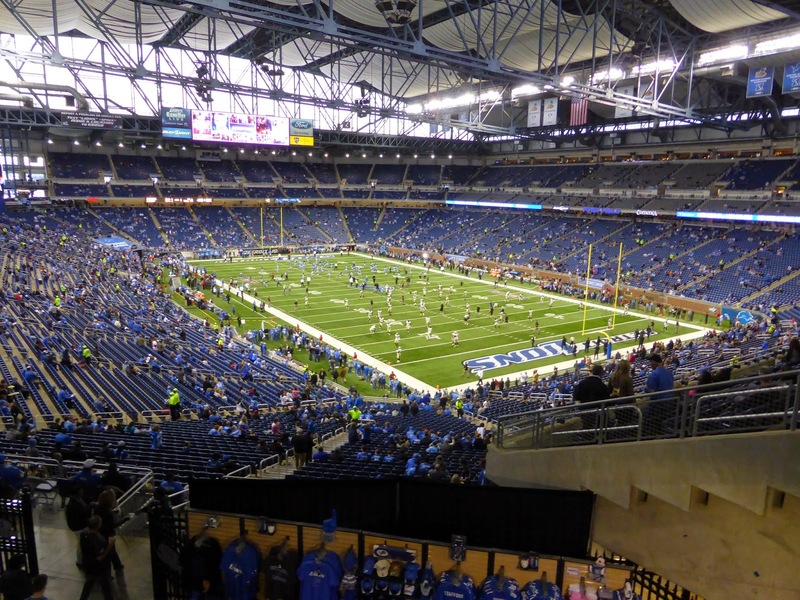 I wrote about Ford Field last season, and have little to add. I can say that Pride Plaza was much more active this time, and the food at the Detroit BBQ stand looked so good that I wish I had saved room for it. The ribs and pulled pork sandwiches were very enticing, but having just eaten at the Hockeytown Cafe, I was unable to partake. Last year, I arrived earlier and in worse weather, so the crowd was far smaller. It shows how you really can't judge a stadium on a single visit; I ranked Ford Field lower because of the poor pre-game experience last year; if I took my trip this season, it would have ranked higher. Inside, the experience was much the same, except for one difference: the crowd was much more energetic. 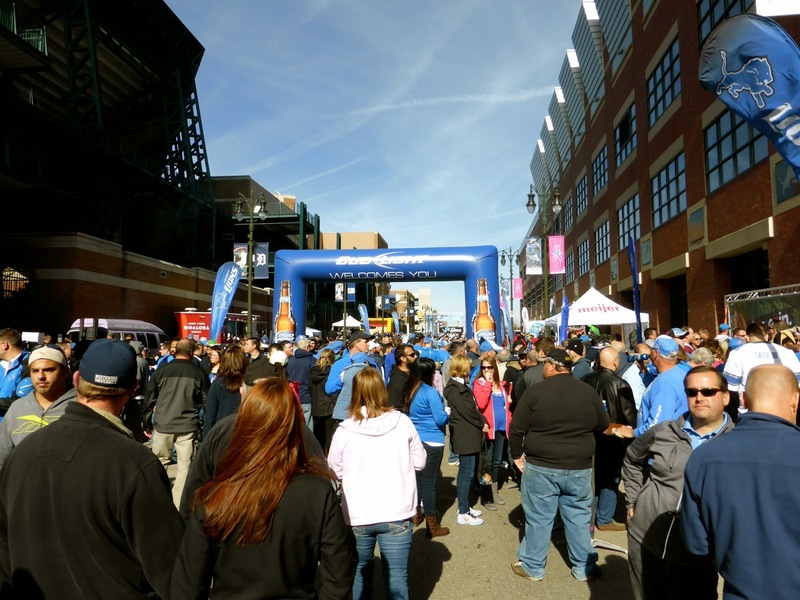 Last year, the Lions won an exciting game against Bears in the game I saw, but I don't recall much about the fans or the atmosphere. That might be because I was sitting in the Family Fun Zone. This time I was seated a few sections away, and I found the fans to be full-throated from start to finish. And what a finish it was. The Lions were 4-2 while the Saints were 2-3 coming off their bye week. A close game was expected as Calvin Johnson was again out injured, with Detroit favoured by 1.5 points. After a scoreless first quarter, Drew Brees connected with fullback Austin Jackson on a 13-yard pass and run to give the Saints the lead. The Lions only points in the half came on a 21-yard field goal from Matt Prater that hit the upright and bounced through. From 21 yards. Unbelievable. The Lions have struggled with kicking this season, missing 10 of 15 and cutting two kickers already. Could that have been a turning point in the Lions season? Little did we know how important that bounce would become. Shayne Graham knocked through a 27-yard kick as time expired to make it 10-3 Saints at the half. 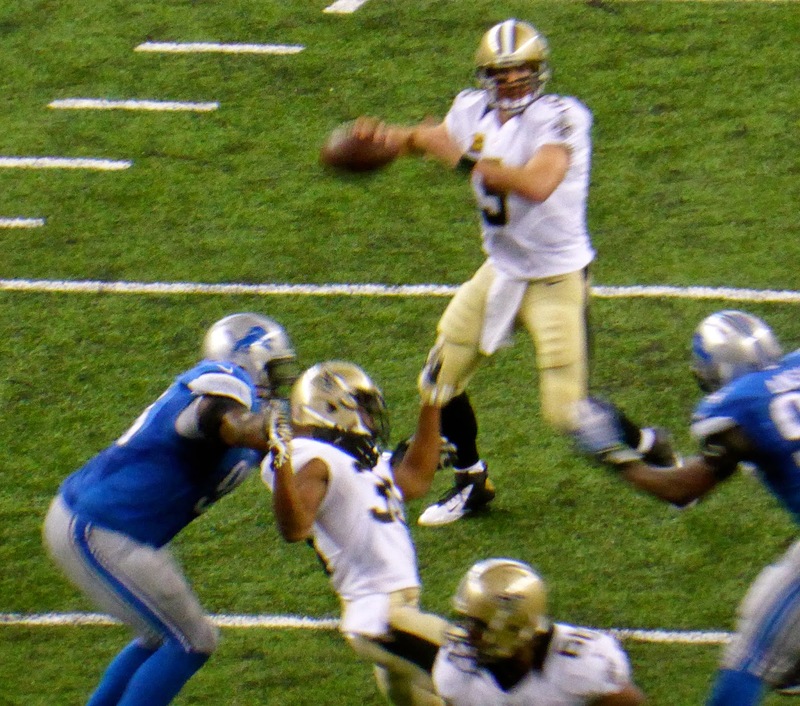 The second half saw the Saints start with the ball and score just over a minute later on a beautiful 46-yard pass from Brees to Kenny Stills, but the Lions responded with their own touchdown with Joique Bell (hidden above) scoring from a yard out. The Saints added a field goal early in the fourth to make it a two-score game, and after Matthew Stafford was intercepted, another Saints FG made it 23-10 with 5:24 left. At this point, some fans decided to leave. Why, I'll never know. Five minutes is an eternity in the NFL. The Lions promptly scored on their next possession with Golden Tate hauling in a pass after cornerback Corey White misplayed the pass. Tate then outran the entire Saints secondary for a 73-yard touchdown leaving 3:38 on the clock. 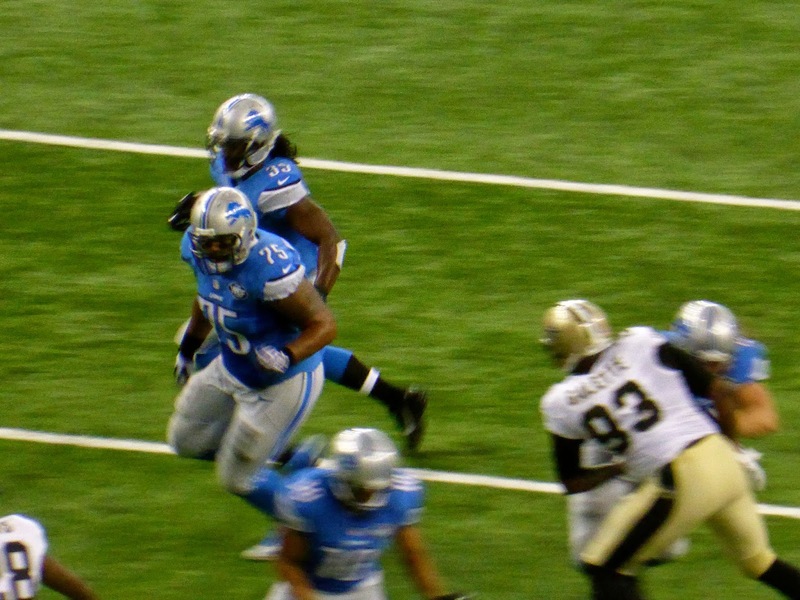 The Lions kicked deep for a touchback and all Brees needed was a couple of first downs to seal the game, but instead he threw the ball to Glover Quin of the Lions who returned it to the 14. Those fans who left must have enjoyed hearing that on their radio. Anyway, the Lions moved just 5 yards in 3 downs, leaving them with a fourth down. Stafford's pass to Reggie Bush was stopped, but a flag was on the field (one of 21 accepted penalties on the day). Saints defender Rafael Bush was called for pass interference and the Lions had another chance. This time, Stafford connected with Corey Fuller for a 5-yard touchdown to tie the game. Prater converted and the Lions had the lead! An amazing turnaround! Never leave early! But there was still 1:48 left, more than enough time for Brees to drive the Saints into field goal range. Thankfully for the home fans though, it was not to be. He scrambled for one first down but could not find an open receiver the other times, and a fourth down toss fell incomplete with 21 seconds left as the Lions completed the improbable comeback. This was not a great game as a whole, but man, those last five minutes were a lot of fun. With Denver and Dallas stealing all the headlines, another D team might be the one to watch out for, because of its D. Detroit has the best defence in the league and are quietly waiting for Megatron to return. Could they be a surprise contender for the NFL title? This game will certainly give them some confidence but I'll wait to see how they do in London against the Falcons before I anoint them any further. Speaking of London, my next big trip is in three weeks when I fly there for four football games and one football game. I've already got my ticket for Man City at QPR just two rows from the pitch, so I can't wait for that. In the meantime, I'll have a few posts on the MLB postseason, awards, and some other hot topics, so keep checking in from time to time.